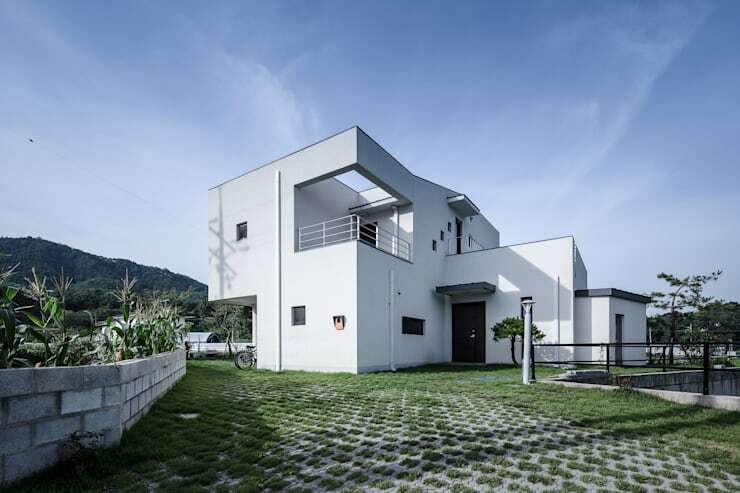 The stunning white cube home we will explore today comes to us courtesy of Korean architects KDDH. 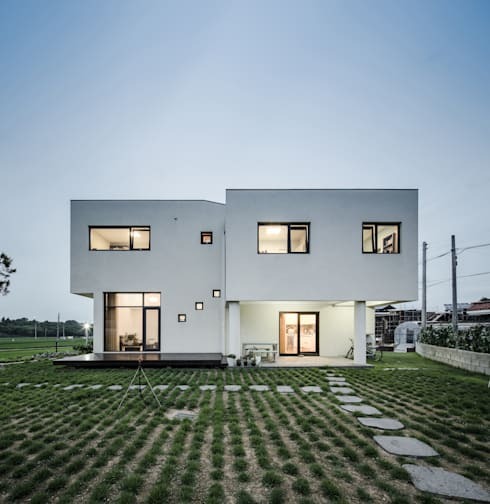 The design is a perfect example of a minimalist home executed with great refinement and precision. The design includes a variety of window shapes configured in a careful geometric arrangement. 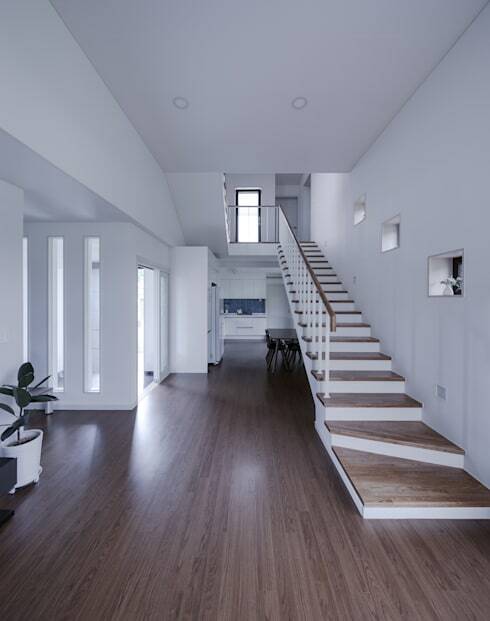 The interior is entirely white and the floorboards are made from highly polished wood. At the same time, there is nothing simple about this home. Every stair tread and window arrangement has been carefully considered and placed so as to create the perfect balance of interest and beauty. So, without further ado, come with us on a photo tour of this very special minimalist home. The 154 metre square home is set in a rural location with lush green surrounds. The fresh natural beauty of the area perfectly offsets the clean, white contemporary facade. Here we have a good view of the simple entrance and the white corner balcony. The balcony roof is made from glass, and the entire effect is breezy, sophisticated and simple. At the rear of the home we have a great view of the various windows in the home. At first this appears as a clean and uncluttered minimalist facade, but on closer inspection, we can see how geometric portions have been pushed and pulled to create an interesting, yet subtle arrangement of various masses, indentations and windows. Finally, the flat roof and unadorned windows perfectly suit the simple, flat landscaping. In a quiet area like this there isn't so much concern for privacy, so the designers have indulged in an entrance with elegant narrow windows. 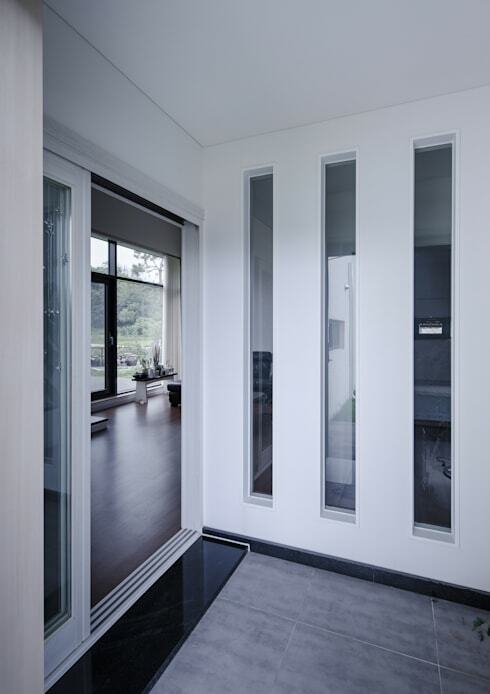 These add decoration to the interior and allow for lots of light to penetrate the home. But what we really love about this view is the highly polished black doorstep, the obvious quality of the materials and the glimpse of the glossy interior. Here we have a great example of how wood and white surfaces can be combined to create a stunning wooden staircase. The first two treads have been designed at an angle to add an elegant sweep and infuse the entrance with a fine, geometric appeal. The long window panels we examined earlier and the small cube windows on the right accentuate this geometric sensibility. As mentioned earlier, the interior is completely painted white. All-white interiors often run the danger of looking a little clinical or cold. But in the living room here, we can see how this danger is completely offset by the soft variations in the warm wooden floor. The spaces also possess lots of variations to avoid a cavernous look. Note how there is great variation in the space, from the large windows, to the lowered ceiling on the right and the differing sizes of the doors. All this might look a little scattered if it weren't for the minimalist decor and palette creating a strong sense of cohesion. 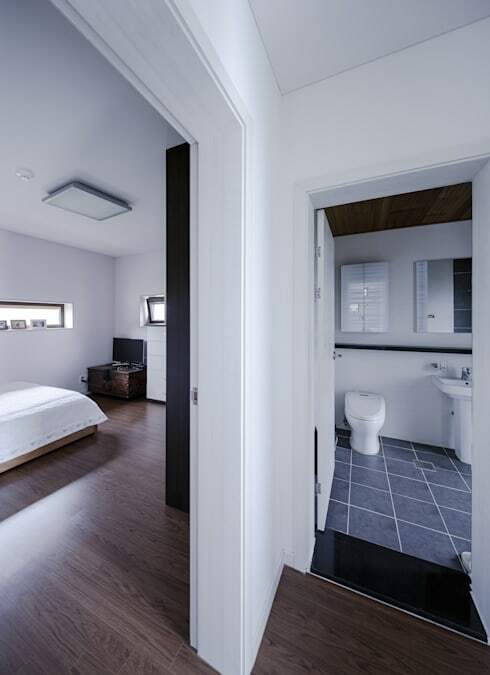 The bedroom and bathroom view here gives the first glimpse of colour in the otherwise monochromatic home. The bathroom tiles are a subtle blue, and the cool colour fits seamlessly into the simple beauty of the home. Finally, catch a glimpse of the narrow window in the bedroom. This perfectly frames the natural view outside while retaining that all-important bedroom privacy. If you want to explore more minimalist homes, check out A Narrow Home with Natural Charm. What do you think of this minimalist cube home? We would love to hear in the comments field below!